For the boys' birthday parties this year, my oldest J requested a pinata. 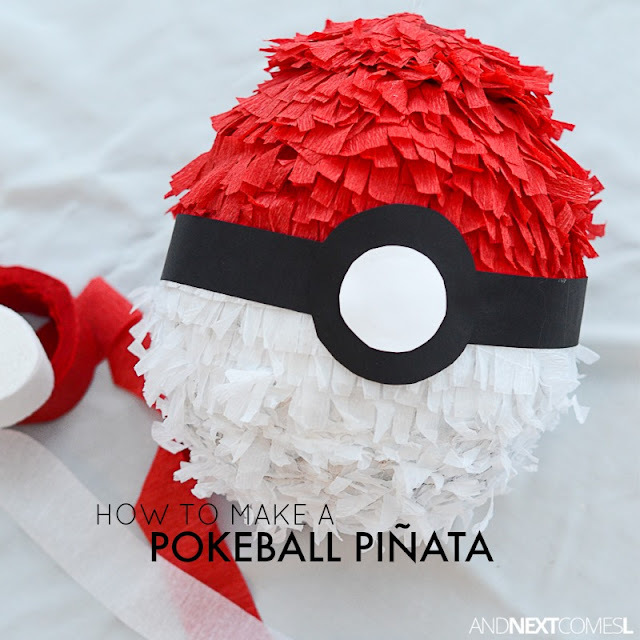 Of course, I agreed even though I have never made a pinata in my entire life. Never too old to learn though, right? 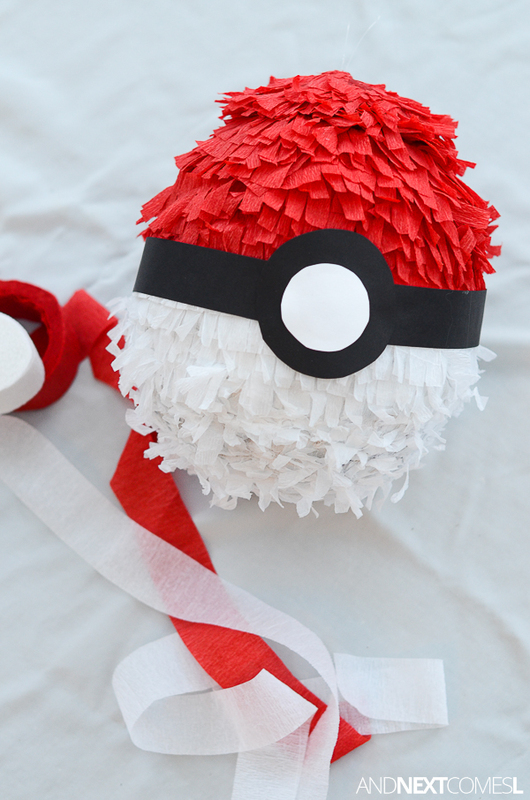 I decided that making a Pokeball pinata would be a good place to start since it's round. No fancy shapes required. Plus, I was already planning on making a Pikachu cake for J. I could do this, I thought. 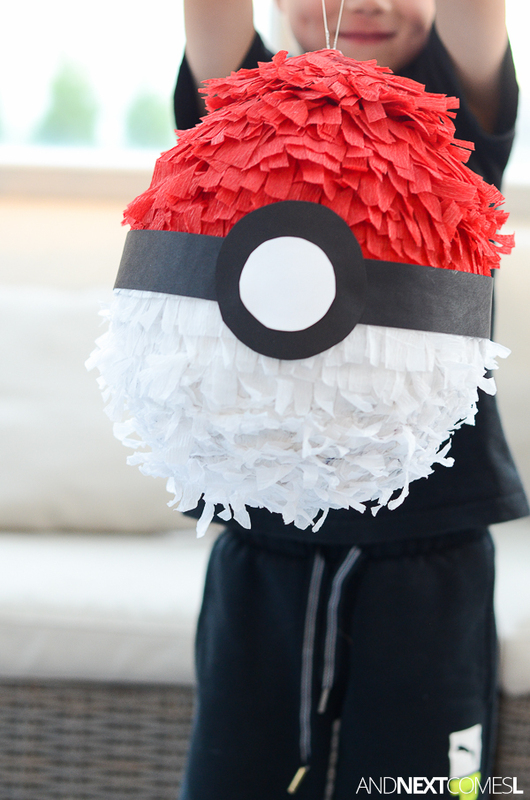 So after hours of labor and love, I made this mighty fine Pokemon themed pinata for my Pokemon obsessed kids and it turned out amazing! Well, except for the top of the pinata. But...let's not talk about that. 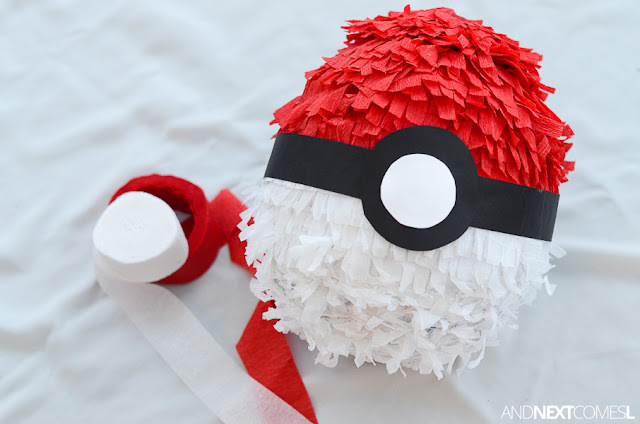 Okay, are you ready to find out how to make a pokeball pinata for a Pokemon themed birthday party? 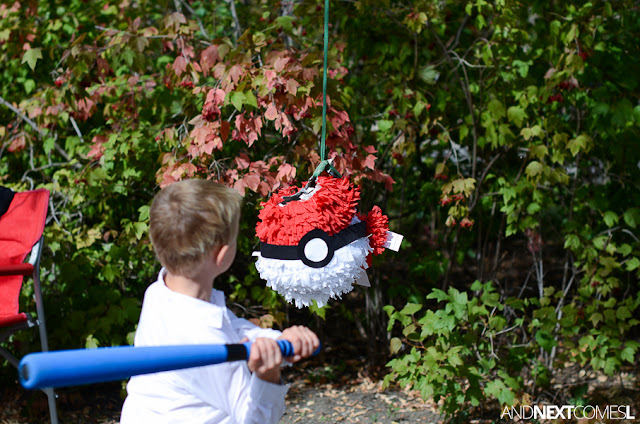 Here is what you'll need to make this DIY Pokeball pinata. I know it seems like a big list, but it's not as bad as you'd think, considering you likely have most of these items already on hand. 1. Make your paper mache glue by mixing one part flour with one part water. Mix well until there are no lumps. 2. Blow up a balloon or a beach ball. I used a balloon because it is what I had on hand. Weeks later I found the beach ball that I knew we had. 3. Rip the newspaper into strips about an inch in width. 4. Dip the newspaper strips into the paper mache glue mix, wipe off excess glue, and layer it on the balloon. Leave a small-ish opening somewhere. Repeat until you have about three or four layers of newspaper. 5. Let the paper mache balloon dry for several hours or overnight. I left mine to dry overnight. 6. Pop the balloon through the small opening that you created in step four. If you used a beach ball, then you could deflate the ball and pull it through the opening. 7. Fold and cut the streamers into shaggy pieces, as shown in the video below at 1:24. 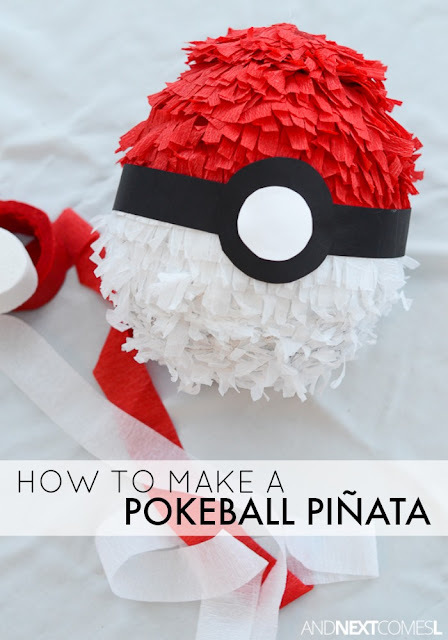 It's not my video, but I found this video tutorial helpful, especially since it was my first pinata ever! Glue each layer to the pokeball using white glue, overlapping with the previous layer. 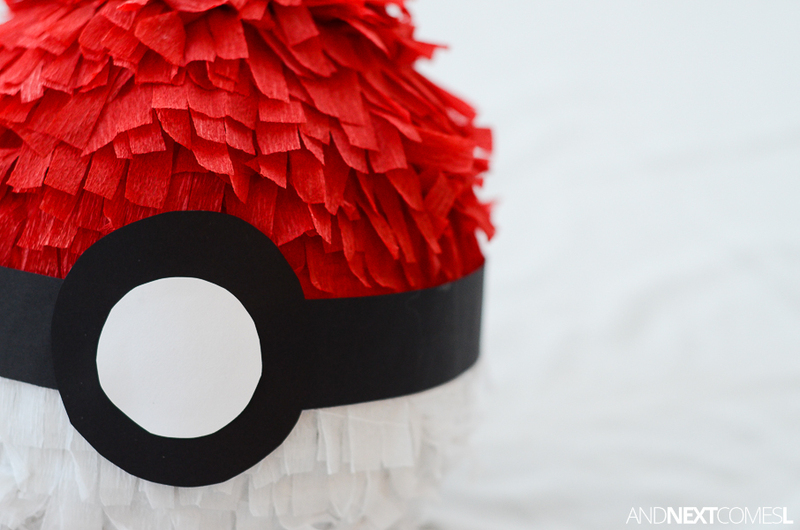 Repeat until you have completely covered the pinata. 8. Cut the black cardstock into strips about 1.5 inches in width. Glue around the middle of the pokeball where the red and white sections meet. 9. Cut a large circle out of black cardstock. Glue it to the middle of the pokeball. 10. Cut a smaller white circle out of white cardstock. Glue it to the middle of the pokeball. 11. 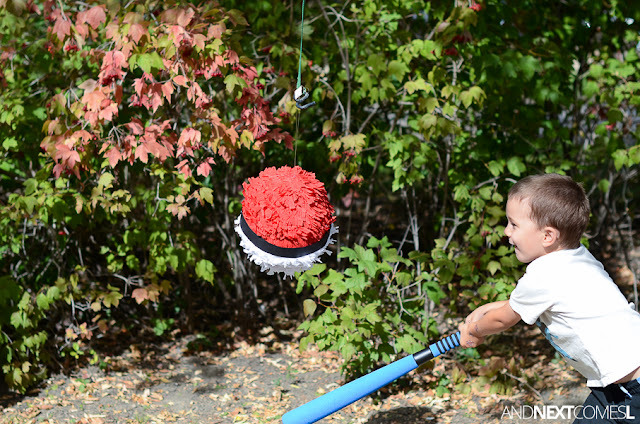 Thread a ribbon, string, rope, or fishing line through the top of the pinata and knot it. 12. Add candy. Don't go too crazy, like K did though, or else the top of the pinata may rip. Not-so-pro tip: if you accidentally rip the top of the pinata off due to the weight of the candy and you couldn't get any candy back out, then I suggest hacking together the top using a variety of the following: scrap cardboard, hot glue, and duct tape to reattach the top of the pinata. See, newbie mistake...lesson learned! 13. Hang it up at party time! We enjoyed a lovely afternoon at the park near our local zoo with our pokeball pinata. We hung the pinata from a tree in a large open area. The kids were armed with a foam bat and small zipper seal bags to catch the falling loot. It only took a few strong whacks before it busted open. Hard to believe I spent like four hours making the pinata, only for it to be destroyed in a matter of minutes! But the kids loved it!